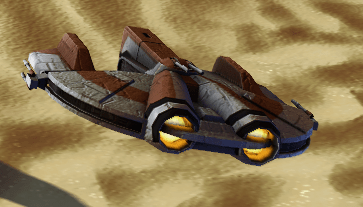 The Ebon Hawk was a Dynamic-class freighter and a smuggler ship that rose to fame due to its use around the time of the Jedi Civil War. It was well-known throughout the galaxy as a ship associated with the Exchange, and it passed through many hands before it was commandeered by amnesiac Dark Lord of the Sith Revan, who was escaping the Destruction of Taris. After Revan joined the Jedi Order, the ship was instrumental in his search for the Star Forge.